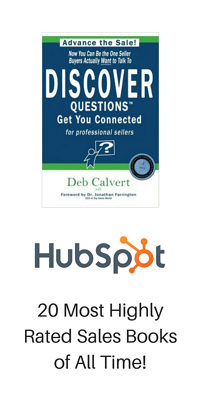 DISCOVER Questions® Get You Connected, written by Deb Calvert of People First Productivity Solutions, has been named one of the 22 Most Highly-Rated Sales Books of All Time. It's the third year DISCOVER® Questions has appeared on this prestigious list, curated by marketing software development giant HubSpot. Click here to see HubSpot's full list of best sales books. DISCOVER Questions™ empowers sellers to differentiate themselves from the pack, creating value for their buyers and connecting in ways they never knew were possible. This how-to includes nearly 20 years of research plus anecdotes from actual sales calls. Readers learn specific skills for increasing their effectiveness in all stages of the sales process.